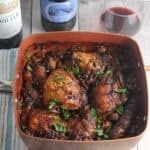 Chicken Cassoulet is hearty French comfort food, with beans, chicken and bakon slowly cooking together for a special meal. Pair with a red wine from the Languedoc, the region that invented the dish. Preheat oven to 300. Spray cooking oil to coat a Dutch oven or similar size oven proof copper pan (we will say “pan” to refer to whichever you are using). Heat on medium high. Add the bacon and cook about 5 minutes per side until just starting to get crispy. Remove from pan and set aside on a plate with a paper towel. Add the chicken to the pan, skin side down. Cook for 6 to 8 minutes without moving to brown the chicken, then turn over to cook for a few more minutes. Remove the chicken and set aside on a platter. Add the sausage to the pan. Cook for about 5 minutes to brown, turning occasionally. Remove the sausages and set aside along with the chicken. Move the meat items to the fridge while you cook the beans. Add the onion to the pan, cook on medium for about 5 minutes until it begins to soften. Add the carrots, celery and garlic to the pan along with the beans. Stir to combine. Add the stock along with the bay leaves, cloves, rosemary, parsley and demi-glace (if using). Bring to a simmer, then reduce heat to low. Cover and cook the beans about 45 minutes, until just tender. Remove the cover from the pot. Use a slotted spoon to remove the carrots, celery, rosemary, parsley, bay leaves and cloves. Add the chicken thighs, sausage and bacon back to the pan. Stir to combine with the beans. Arrange the chicken so that the skin is facing upward near the top of the pan. Move the pan to the oven and cook uncovered for two hours. A bit of a crust should be starting to develop after two hours. Remove the pan from the oven, gently stir, and return to the oven. Continue cooking uncovered in the oven for two more hours, stirring to break up the crust every 30 minutes. After 4 hours total cooking time in the oven, let the cassoulet cook for 1 more hour undisturbed to let the crust build up a bit more. After 5 hours cooking time in the oven, your cassoulet should be ready to enjoy! Remove carefully from the oven, and scoop into bowls to enjoy with a red wine from the Languedoc. Bon appétit!